Plowman’s current show, ‘A Life Drawing’, at Nottingham Castle Museum, comprises of a selection of his own drawings made since the late 1970’s, juxtaposed with a selection of drawings from the archive of Nottingham Castle Museum and Art Gallery. A lot of the drawings he looked at in the museum’s archives were about place albeit representations of specific places geographically located. This experience has highlighted for Plowman the influence on his practice of his geographic location at key points in his career and life. The collection of his drawings reflect how geographies have impacted and informed the drawings produced. Following his move in 2013 from Lincolnshire to Brighton this exhibition is a reflection on this aspect of Plowman’s practice. 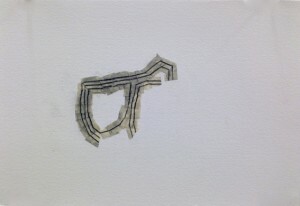 The series of drawings exhibited have been made during the last 12 months in his new studio. They form a distinct body of new work in which Plowman has developed a process of pencil on tape on paper which allows him to mimic the trope of the gestural pencil mark, the layering of these marks without his pencil touching the surface of the paper. 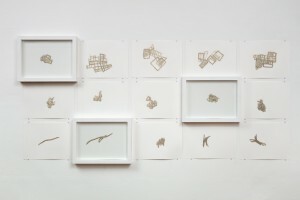 The imagery contained within each drawing has been generated by the process he has employed and reflects his new geographical (urban) location.